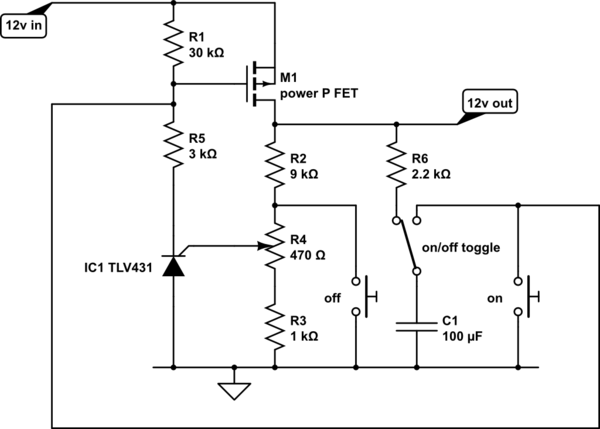 I have a simple arduino driven charger for solar energy to pass into 12V lead-acid battery. However, to use the stored energy I need an analog circuit to cut off discharge at 11.5V. I think a voltage divider ( or 10V zener ) to a N-MOSFET (IRF630), or via a small signal N-MOSFET (2N7000) to a P-MOSFET (IRF9630), plus some extra bits, may be sufficient to switch a relay. I would prefer ditching the relay but then I'd need to heavily heatsink the MOSFET. My main concern with the relay method is that the relay itself pulls about 0.33W when normal-closed (to clarify, this is also when I discharge the battery), which is a waste. Is there a best practice for cutting off 12V batteries? I have found many on google, of course, but most are 'instructable' type methods, others are rather bulky. M1/IC1 form the latching power switch. It draws no power when off, and little when on. The TLV431 (not the right symbol, this was close) is designed as a 3 terminal shunt regulator, that maintains the sense voltage at 1.24v. You could think of it as a high gain NPN transistor, with a 1.24v base threshhold voltage. Consider what happens at the switch point. The sense voltage is around 1.24v, the supply current is passing through 200uA so there's 6v on its supply. This is within its normal operating conditions. Any tiny change in output voltage in either direction will result in switching off, or staying well latched. I've tested the performance of the TLV431 open loop, and it's well behaved. The cathode stays above 1v, even when ref is well above 1.24v, and it comes out of 'saturation' with no hysteresis. With a cathode resistor of 33k, and 12v supply, it goes from full on to full off in about 4mV of ref terminal movement. Note that the TLV431 is an unusual device in that the same part number from different suppliers has different specifications. The Texas device only works to 6v, so cannot be used here. The On Semi, Diodes Inc and Zetex devices are specified to 16v, so should be OK. There may be other manufacturers I have not named. I've shown the components I use to toggle the circuit on and off. Note that for toggling off, the load voltage has to collapse far enough while C1 is holding the FET off. It has only the time constant C1.R5 to do this. If the load has a large reservoir capacitor and a low load, the time constant may need to be increased further. Not the answer you're looking for? Browse other questions tagged voltage lead-acid powermosfet or ask your own question.